Place the flour, cocoa, both the sugars, the butter, vanilla and eggs in a large bowl. Mix until smooth. Add the chocolate and stir to combine. Lightly grease and line a 20cm square tin with non-stick baking paper. Spread the mixture into the tin. 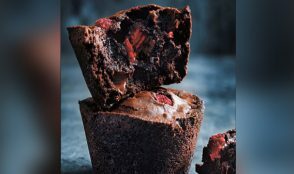 Bake for 50 minutes – 1 hour or until the brownie is set+. NOTE + The brownie is ready when the top feels set to the touch. 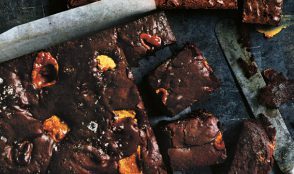 If you’re not serving the brownie warm, let it cool in the tin, then turn out and slice into squares. It’ll continue to set in the tin, but stay soft and fudgy in the centre. The two types of sugar in these brownies work their magic in different ways. Caster sugar lends sweetness and helps create a smooth and crispy top. Brown sugar adds to the luscious moist centre. Brownies will keep in an airtight container for up to 1 week. NOTE: This recipe begins with uncooked brownie mixture – simply prepare the basic recipe until the end of step 5. + This recipe begins with uncooked brownie mixture – simply prepare the basic recipe until the end of step 2. Perfect as individual desserts, serve warm puddings with double cream.